It turns that although a brilliant idea the reality is quite different. The part of the oven that is self-cleaning is the liner which is called a pyrolytic liner once a month most manufacturers recommend that you heat the oven to 500 Degrees Celcius this then actually vaporises the fat and carbon deposits resulting in a clean oven lining. Sometimes the resulting clean is just not what you would expect; often customers explain that they have performed numerous cleaning cycles just to be left with fat or carbon deposits still present on the lining, this leads to constant smoking from the oven when in use. So something purchased for ease of use becomes the polar opposite. It is of vital importance to remove all of the oven shelves and trays while putting your self-cleaning oven in a cleaning cycle as leaving them in can lead to the shelves discolouring and at worst, damage to the oven. What about the shelves and doors? Even if your oven’s self-cleaning liner is functioning correctly, the cleaning cycle only affects the liner. 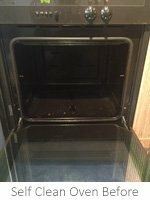 The trays shelves and most importantly glass door will not be cleaned in the cycle I can, of, course clean all of the removable parts and oven door. I can also clean self-cleaning liners providing they are removable as this allows me to use my dip tank to remove carbon and fat deposits completely; unfortunately, I am unable to help if the self-cleaning liner is fixed to the oven. 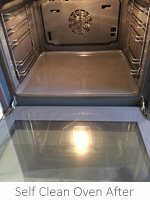 The pictures in this post are of a self-cleaning oven I recently cleaned in Godington Park Ashford, if you need some help with your self-cleaning oven feel free to contact me. 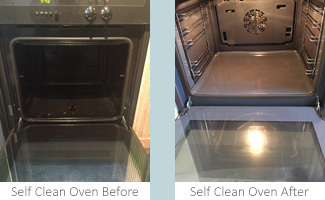 I am insured, fully trained and have undergone professional oven cleaning training all of the products I use are bio-friendly and completely safe to use around children and animals.